Curse the seas, because Pirate Tweets has come ashore in the App Store fresh on the heels of its crunk twin brother Ghetto Tweets. This must-have, free iPhone app brilliantly transforms all of your tired Twitter ramblings into 140 characters of Yo, Ho, Ho-tastic Pirate slang each time you launch the app. Pirate Tweets not only converts all your tweets into classic pirate speak, it also piratizes those boring, self-absorbed tweets from the twits you insist on following. There's just no better way to spice up the chatter of your beloved Twitter scallywags without them ever knowing. It's hard to imagine this much random fun being delivered totally free. 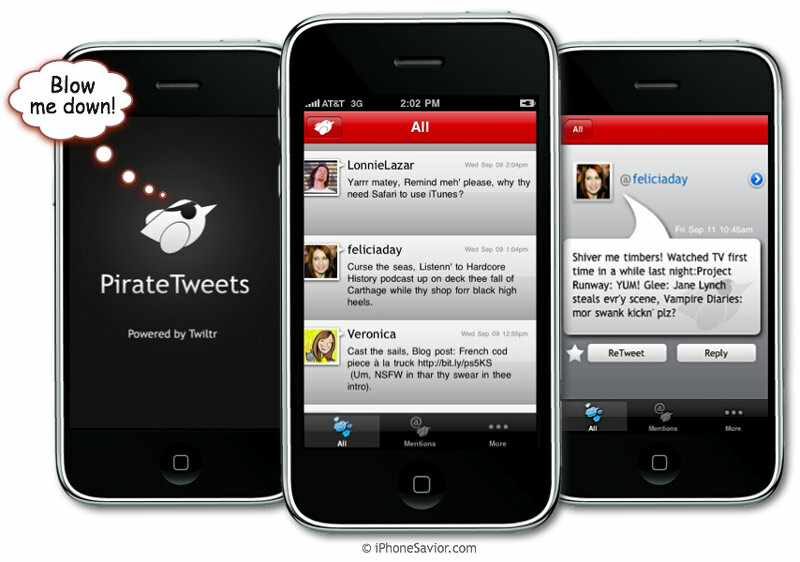 The future of Twitter begins now with Pirate Tweets! Arr! This is my tweet on twitter as a pirate. What do you think of it?